BarCodeWiz Barcode ActiveX Control lets create barcodes easily and add barcodes to Microsoft Office with one click. Use it in your favorite programs. 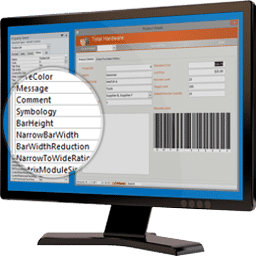 Barcode ActiveX Control easily integrate with MS Office, VB6, .NET, Visual C++, and other programs that take advantage of ActiveX technology. Includes most of the popular barcode types. BarCodeWiz Barcode ActiveX Control can generate a million barcodes in about 20 seconds. If you distribute your own programs, you will be happy to know that only one file, barcodewiz.dll needs to be added to your program. Barcode ActiveX Control uses vector graphics for highest quality images. This is important with barcode scanners, which demand highly accurate images. It means no more scanning errors! The program takes care of the mundane details: start/stop characters, check digits, minimum dimensions, maximum characters, quiet zones, and more. BarCodeWiz barcode ActiveX draws barcodes as images, and does not require the purchase of any barcode fonts nor any additional software. Add barcodes to Microsoft Office with one click. Create a single barcode, pages of labels, or mail merge documents in Microsoft Word. Convert cells to barcodes or full sheets of labels directly in Excel. Add barcodes to your to your Access Reports. Choose from 23 types of barcodes, both linear (1D) and 2D. Compatible with all versions of MS Office from 97 to 2016 and Windows 2000 to Windows 10. With BarCodeWiz Toolbar you can add all major barcode types to Microsoft Office applications with a click of a button. In Microsoft Word, create single barcodes, pages of labels, or mail merge documents. In Microsoft Excel, select a range of cells and automatically convert each cell to a barcode. In Microsoft Access, create reports with barcodes based on your data tables. Compatible with all versions of MS Office from 97 to 2016 and 2019 (including 365) and Windows 2000 to Windows 10. Includes both 32 and 64-bit versions.